Cosmetics 101: What's in your beauty bag? Blush: Always take your favorite blush with you, especially when going out for long time during the day. Bobby pins: These are truly lifesavers for any hairstyle emergency. Chapstick: It can quench dry lips, plus giving it a tasty touch. Highly recommended for those dry climates. Powder: Compact or loose, it can fix and improve your makeup through the day. Hand sanitizer: Oh the bacteria out there that can be easily avoided with these pocket-size sanitizers . Oil absorbing sheets: They clean the oil out of your face by sweeping them on the shiny areas, without ruining your makeup. Pocket mirror: Always a good idea to keep it close at hand, especially when going out for eating. Moisturizer: This is the most underrated and probably the most necessary item. Always keep one small bottle in your bag for those dry, humid days. 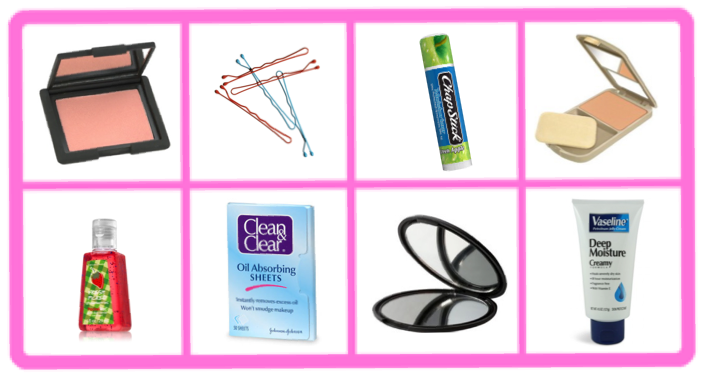 What's in your beauty bag?